I absolutely adored Clarke’s The Assassin’s Curse duology. The world she created was so vivid and multi-faceted that I wanted to curl up and sail along the high seas with Ananna. I was ecstatic when I found out there was going to be a second duology set in the same world. The Wizard’s Promise follows Hanna whose mother sailed under Ananna who Hanna is named after. That is where the similarities between Hanna and Ananna end though. Hanna is definitely her own person. She wants to study magic but is apprenticed to a local fisherman. She wants nothing more then to go on an adventure but instead leads the same monotonous island life day in and day out. Until the day all of that changes and Hanna is swept up on an epic adventure. The problem was this epic adventure takes a long time to get underway. There is a lot of down time in this story. A lot of time spent waiting for the action to start happening, for the bad guy to appear, for the boat to get fixed. I think these “extra” parts in the story could have been done away with and the story would have been better for it. There just wasn’t that immediacy in The Wizard’s Promise that The Assassin’s Curse duology had. Despite this lack of action I still found myself enjoying the story. I was sucked back in to the world Clarke created, and was excited to learn more about the northern islands which we didn’t see much of in The Assassin’s Curse. I liked the wide cast of characters present in this novel. Fisherman, Wizard’s, Villain’s, not-human boys, there is a little bit of everything. I especially liked Isolfr, it was fun riddling out his motives and what exactly he is. He stole the scenes he was in and despite frustrating me to no end became one of my favorite characters. I look forward to seeing more of him in the sequel. 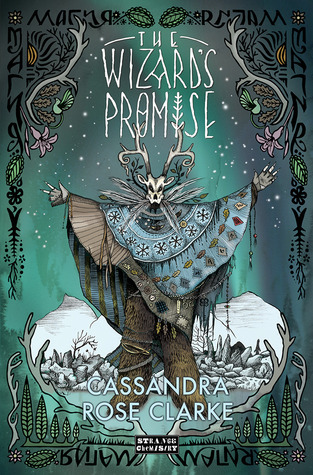 Overall, The Wizard’s Promise was a good novel it kept me entertained and it was fun to return to a familiar world through a new set of eyes. I am looking forward to the sequel which I hope will ramp up the action earlier, and give us more insight in to the Mists. Aww great review Emily! Isolfr sure sounds special :) though too bad about the slow plot. I've heard of this author but haven't read anything from her yet. Glad to hear you still enjoyed it overall!